It's always exciting to introduce a new plus size brand. Anything that offers and extends our choices is great to see. The latest brand to enter the forum is Love 4 All who currently offer a small but well-rounded range of dresses, tops and leggings. I have been reliably informed that the brand will grow over time and include a wider variety of clothing as well as size range. I opted to try out the red printed maxi dress, something I knew I could layer up while it was still chilly but easily wear on its own with sandals in the summer months. The dress is partially lined, with small split detail to each side of the skirt. I am 5'7" and it's around ankle length on me. I particularly loved the double strap detail and shallow v-neck, great for 'modest' me! When I wore the dress it was still a bit chilly, so I layered it with a black tee, popped on my cropped denim jacket, and toughened up the look with biker boots for a more grunge-esque feel. The dress is lightweight and the fabric is a crepe-type material. I found it true to be size, and one great feature on the website is that it explains if the item is true or whether you should size up or down. They also show how the styles look on varying sized models. 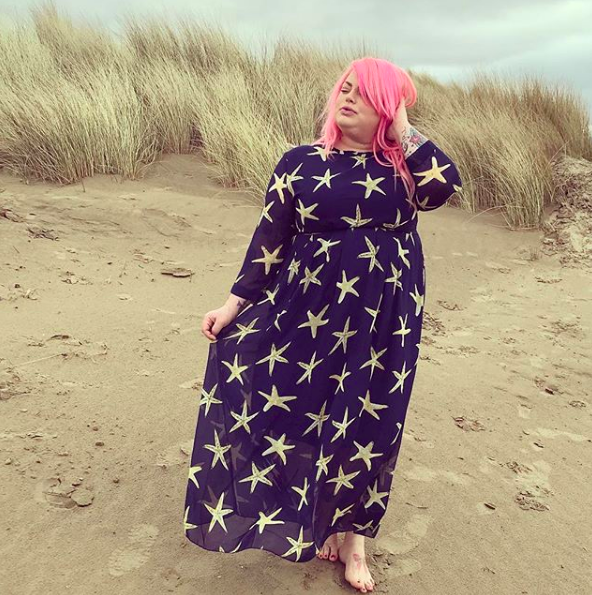 I think over all the range has some growing to do, but it's off to a great start and has some stand-out pieces like the Starfish Print Dress seen here on Sam of FattyBoomTatty. I'm really looking forward to seeing what the future brings for this new brand!